We advise you on the optimal use of a location. We consider your requirements such as number of persons, visitor guidance, catering areas as well as security-relevant aspects such as escape route widths and lengths, fire protection etc. and prepare the documents for any permits to be obtained. 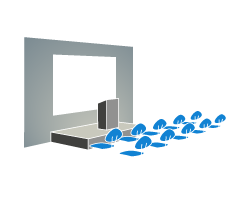 With our help, your conference will run smoothly and you can save costs through optimization. According to your needs we create a technical concept and offer you everything from one source. Standard equipment like sound system or lighting is often included in the rental contract of a conference centre, for example. We then supplement what is necessary and agree on the interfaces, so you only have one contact person and do not have to worry about coordinating different trades. The smooth running of the presentations is a key to the success of a conference. We have been successfully using our proprietary development SpeechCon worldwide for years and is constantly being further developed and optimised.